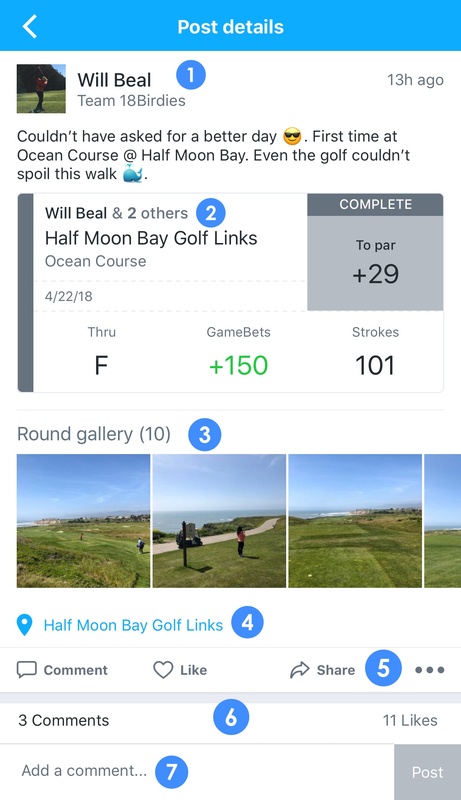 The 18Birdies Feed connects all 18Birdies users in one social hub. Within the 18Birdies Feed, users can see updates from their connected friends, 18Birdies Brand Ambassadors and vendors who have partnered with 18Birdies. Every 18Birdies user gets automatic access to the public 18Birdies Feed where the most recent posts from your connected friends, 18Birdies Brand Ambassadors and 18Birdies partners appear at the top of your Feed. Under the Following tab in the Feed, you have access to all of the content posted by your friends, followed users and other posts within the various Feed categories. Tap the Explore tab at the top of the Feed screen to view content from various providers. This content is updated regularly, so be sure to check this section out often! To access tutorial videos for all aspects of the app, open the app and tap Feed. Scroll down and tap App Tutorials. Tap the users name to open your Profile page or to open another user's Profile page. Tap a picture to open the Round Gallery. Tap the golf course name to open the Course Profile. Tap Comment to open the comment text box. Tap Like to like the post. Tap Share to share on 18Birdies or Facebook. Tap the three dots to Delete your post or Report Abuse for another user's post. Tap Comment to add a comment or tap Like to like the post. Tap in the 'Add a comment...' box to add a comment to the post. 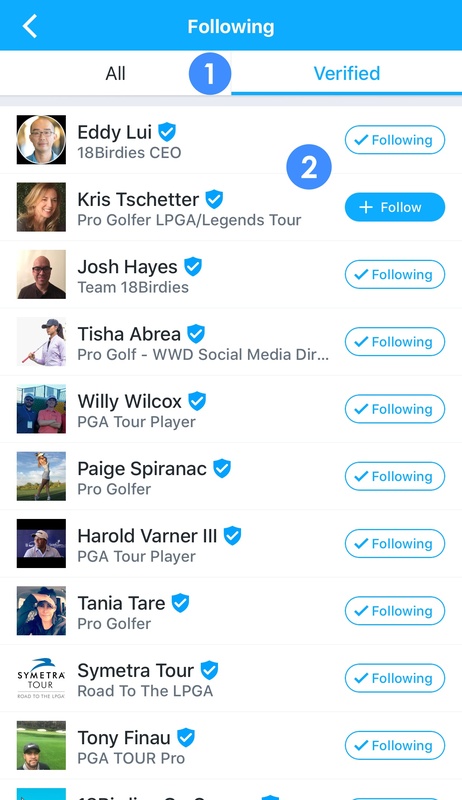 Every newly registered 18Birdies account automatically follows all 18Birdies Verified Users and will see new posts from the 18Birdies Verified Users on their Feed. Tap between All and Verified to switch between all users that you follow or Verified users. Tap the Follow/Following button to switch between Following a user or to not Follow a user. Any user with a blue check mark next to their name is an 18Birdies Verified User.